If you are a leader, you are in the relationship business. Whether a colleague, client, vendor, front-line worker, or networking connection, you interact with people every day. If, in your interactions, you are mindful about making a human connection, you will establish the foundation for a positive, beneficial relationship. A key to making that connection is listening—and listening takes practice. 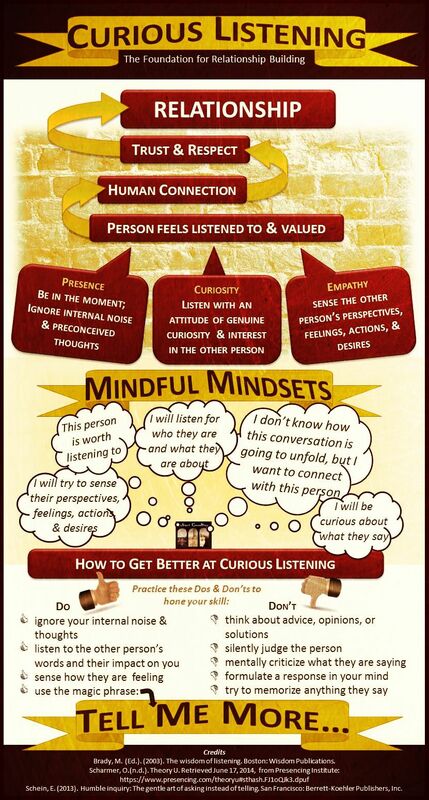 The aim of curious listening is not about what we hear, per se; it is about the other person feeling valued. If leaders approach an interaction with the mindset that the conversation is worthwhile, then the other person will feel “listened to” and a connection is made. What would happen to your interactions if you focused on curiosity and did not think ahead about your response? What are the consequences of not truly listening to the people you interact with? Brady, M. (Ed.). (2003). The wisdom of listening. Boston: Wisdom Publications. Goleman, D. (2013, December). The Focused Leader:How effective executives direct their own – and their organization’s – attention. Harvard Business Review. Schein, E. (2013). Humble inquiry: The gentle art of asking instead of telling. San Francisco: Berrett-Koehler Publishers, Inc. TIP JAR: If this made you think or smile, please share! This entry was posted in Empathy, Leadership, Networking, Relationships and tagged caring about others, curious listening, empathy, humble inquiry, leadership, Listening, listening with intent, making a connection, making connections, presence, sincere listening. Bookmark the permalink. Enter your email address to follow Masterpiece Leader and receive notifications of new posts by email. Leadership Revolution: The Coaches Are Coming!